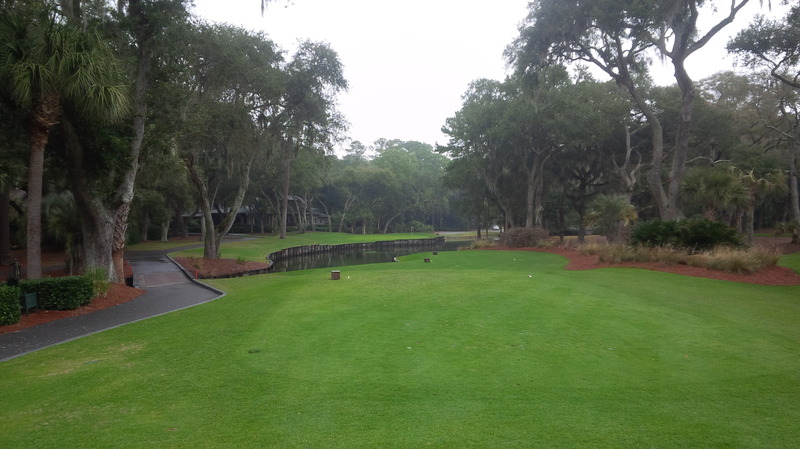 A look back down the first fairway of Harbour Town from the green. I was finally, really there. On this fourth trip to Hilton Head Island, I finally played Harbour Town Golf Links. 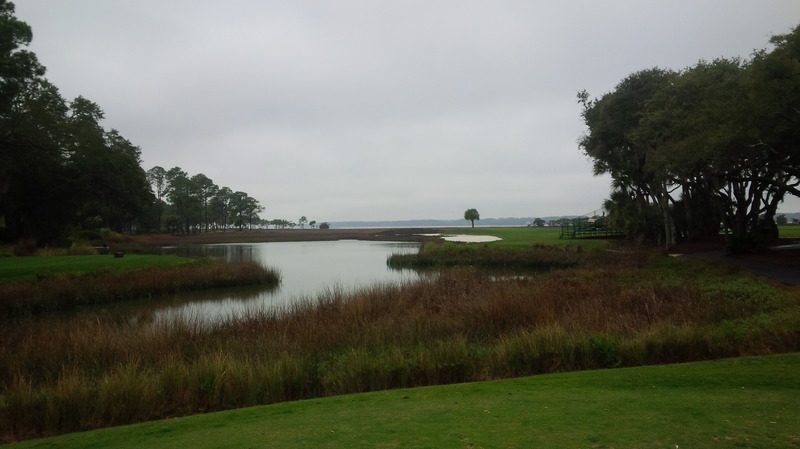 Since The Wife and I began planning this year’s trip last fall, I looked forward to playing the epochal Sea Pines plantation course and crossing it off the Golf Bucket List. It is a course every golfer has heard of, and one that everyone who’s visited Hilton Head has an opinion on. While all the national publications give Harbour Town glowing reviews, many independent reviewers and trusted people I’ve talked to give it a lukewarm critique, at best. In order to avoid the crushing disappointment of wasting $150.00, I tried to temper my enthusiasm and approach the day without expectations. Harbour Town was created by famed golf course architect Pete Dye in 1969, with design consulting performed by Jack Nicklaus. Though not the first course on the Island, since its opening, Harbour Town has been the preeminent golf destination on Hilton Head. The course’s success has allowed the Sea Pines Plantation development to flourish for five decades and has shaped Hilton Head into one of America’s premier resort locations. 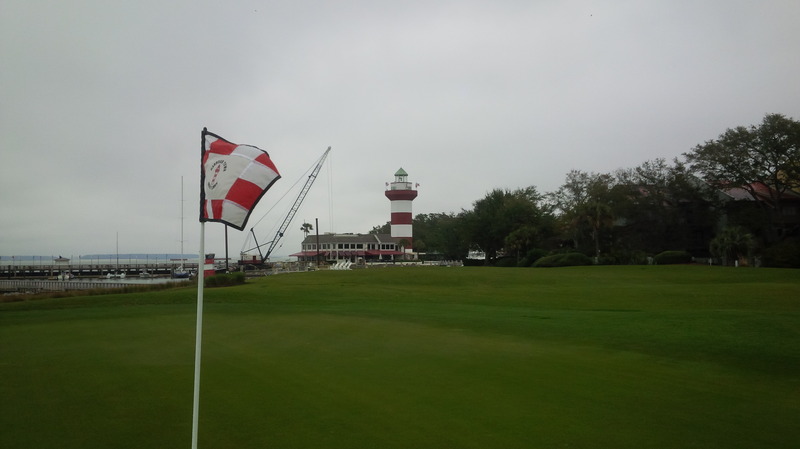 Harbour Town hosts the Heritage Classic, or what is now known as the RBC Heritage, a PGA Tour event held annually the week following The Masters Tournament at Augusta National. It is one of a handful of PGA Tour venues on which the general public can “play where the pros play,” and only the second such course I have played (Cog Hill #4). 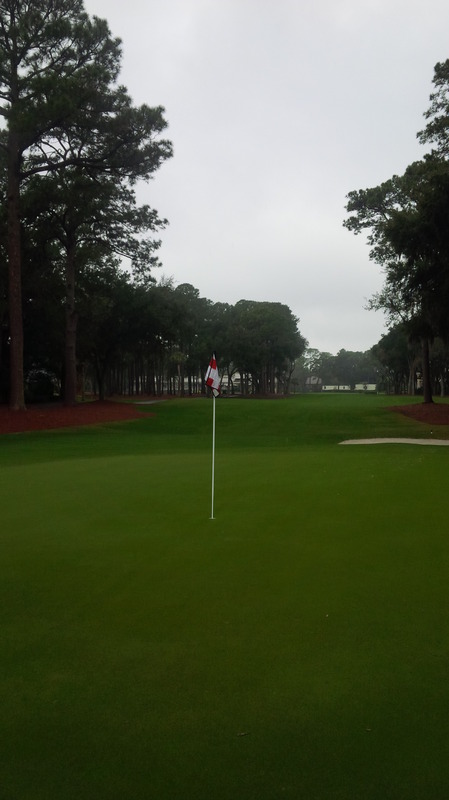 Harbour Town was in immaculate condition. I could barely believe how incredibly green the entire course was already. The entire course was television ready a month before the RBC Heritage. The professionals play Harbour Town from just under 7,000 yards and play to a course rating and slope of 75.0/146. I kept my pride in my pocket and played the Dye Tees, which play to a relatively more forgiving 6,603 yards and a course rating and slope of 73.0/141. By those numbers, Harbour Town would be the most difficult course I had ever played. Earlier in the week, it appeared Wednesday would have the best golf weather. When Wednesday arrived, the temperature had barely reached 40 degrees by noon. Intermittent rain showers and mist were constants of the cold, cloud covered morning prior to my 12:18 tee time. 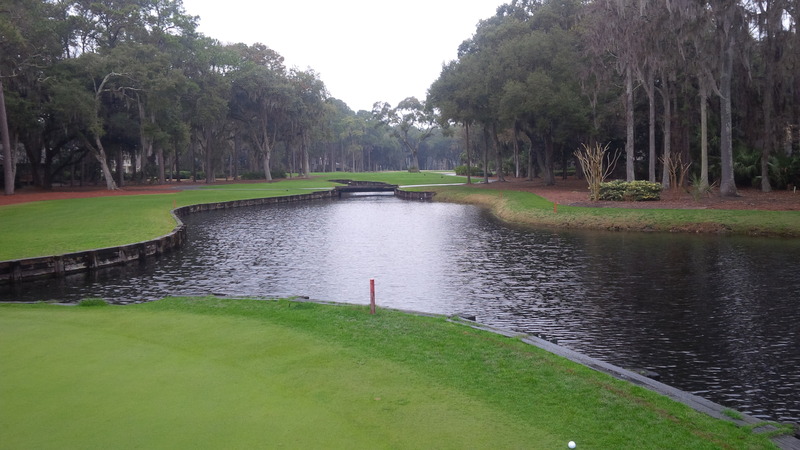 The difficult par 3 4th hole demonstrated that Harbour Town is much more than just its signature closing hole. It was wet enough that I was concerned that perhaps the course might close, so I placed a call to the pro shop before leaving the hotel. The golf pro I talked with was perfectly friendly and said they were allowing play as normal, so I was welcome to come on out to the course. 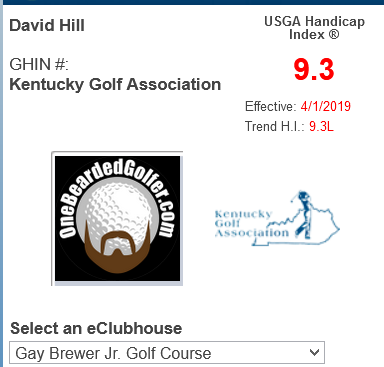 I suspected the near frigid weather might have kept some golfers off the course, but as a single, I still expected to be paired with a couple other golfers, as is customary at most courses. I was shocked to discover upon arrival that the course was empty. I don’t mean euphemistically “empty,” as in it would be a slow day for the pro shop. I mean I would be one of two golfers on the entire course all day, and, according to the cart lady, that guy quit after 9 holes. The very sweet, very frozen cart lady laughed as she wished me well and refilled my coffee on the 5th hole. Bless her heart, she would check on me twice more during my round, bringing my as-requested chicken salad sandwich, despite my being her only customer of the day. I don’t think it sunk in until I was a couple holes into my round, but I could scarcely believe that I had an iconic, five-star golf course all to myself. So, even if not perfectly unique, I suspect my Harbour Town experience places me in some unimaginably exclusive percentile of rarest golf round experience. What was equally unbelievable was that everyone at Harbour Town, from the golf pro and the starter to even Steve, the poor forecaddie that I didn’t have the heart to make join me in the impending battle against mother nature, to a man, could not have been nicer or more welcoming. 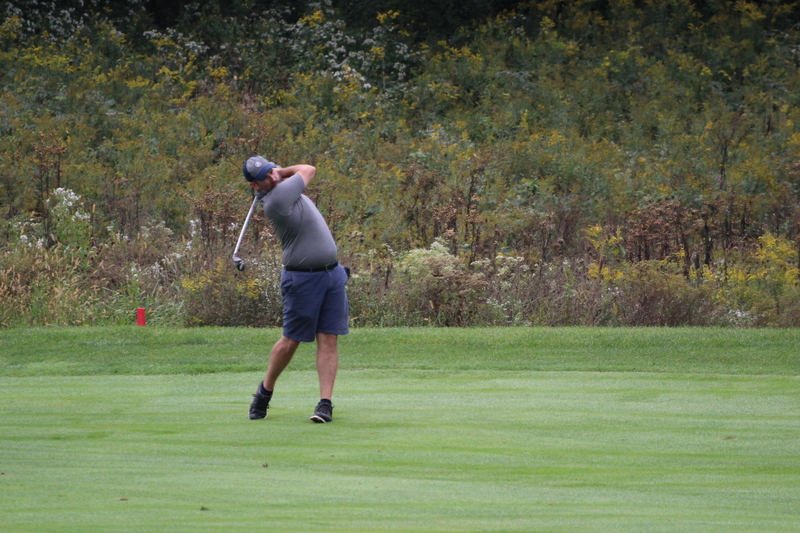 Luckily, the rain and mist stopped after I had completed about four holes, so I was able to complete my round under relatively favorable conditions. Despite the ridiculous weather, and my damn-the-torpedoes resolve to play that day, each staff member made me feel like I was the most important person they would talk to or deal with all day. Not a single sneer or sigh of disbelief. They probably thought I was crazy, but they legitimately made me feel like it was any other day and Harbour Town was my home course. I found each of the four par 3 holes to be unique, memorable, and great golf holes. As I stood on the first tee, I was amazed at how very green the golf course was so early in the season. Every other course had green, wispy pine trees, mostly green putting greens, and varying shades of green(ish) fairways. Each course I played on the Island that week understandably contained a fair amount of brown, dormant Bermuda grass. 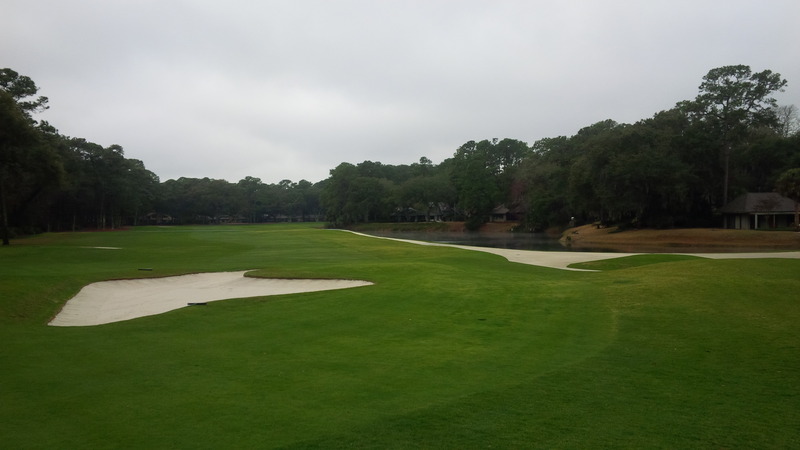 Yet, Harbour Town alone had bright green tee boxes, lush fairways and approaches, and vibrant rough. Notwithstanding unseasonably cool temperatures and rain for most of the prior 48 hours, the putting greens were absolutely rock hard. Harbour Town has a reputation for firm, fast greens, and not even active rain showers could slow or soften the greens on this day. Granted, I only managed to hit a handful of greens in regulation, but even those good shots left scant evidence of a ball mark on the putting surface. It gave me a new appreciation for just how much spin the professionals must produce on their approach shots to make a ball dance and stop on PGA Tour quality greens. Much has been written about Dye’s and Nicklaus’s tendencies for designing golf courses that require golfers to think their way around the courses. Dye is famous for using angles, deep bunkers, and small greens that force a golfer to try to execute a strategy dictated by the layout of the individual holes. My experience only confirms this reputation, as ball flight control, shot shaping, and putting precision were my scoring determinants. I was able to avoid the monstrous bunker on No. 13 to get up and down for my first par of the day. I felt like length was really only of secondary importance as I made my way around the course. I was constantly chipping and pitching to the diminutive putting surfaces from the sides and backs of greens, rather than playing up from being short of the green. 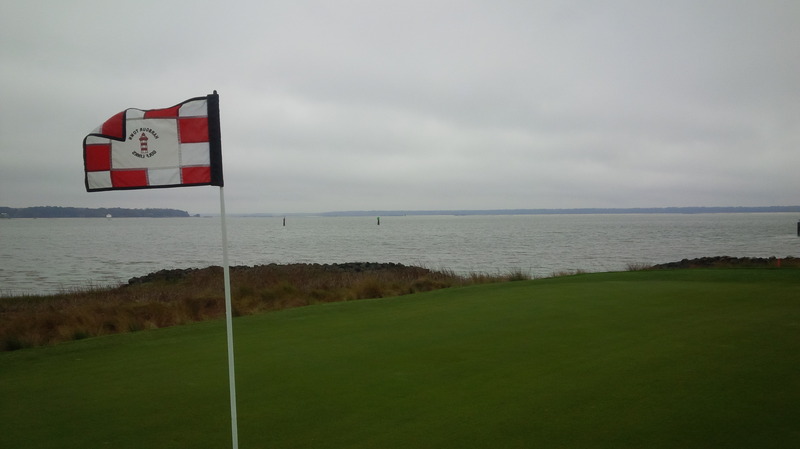 Only standing on the 18th tee box, with a 30-40 mile per hour wind howling directly into my face off Calibogue Sound, did I feel like the the golf course could overpower me or demanded a shot I might not be physically capable of producing. On each tee box, I simultaneously had to account for the ideal shot required as well as how to avoid the bad miss or “big number” location. I’m not sure if that is something I normally do instinctually or not, but I found myself consciously assessing each tee shot before I addressed the ball at Harbour Town. 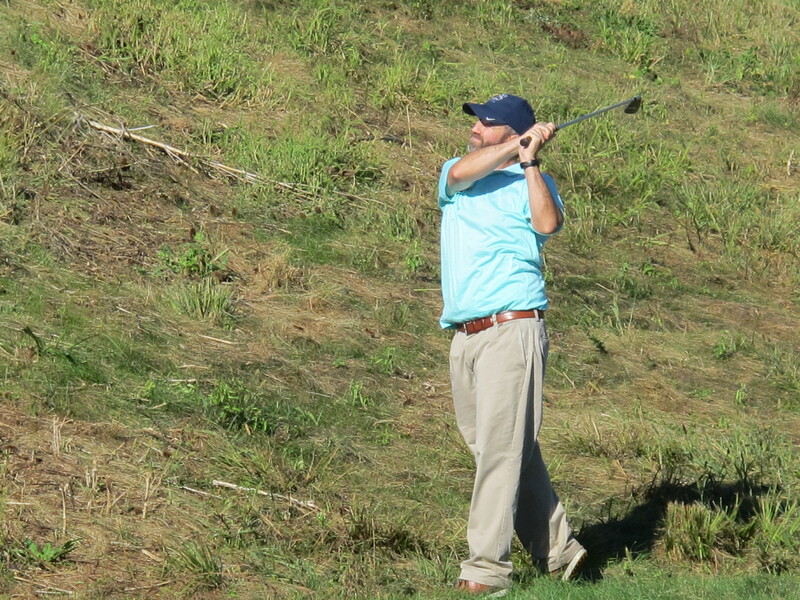 The par 3 14th hole demanded an accurate tee shot into an add-one-club wind without any real bailout area. One feature of the course that really surprised me was how wide the individual holes are in reality. 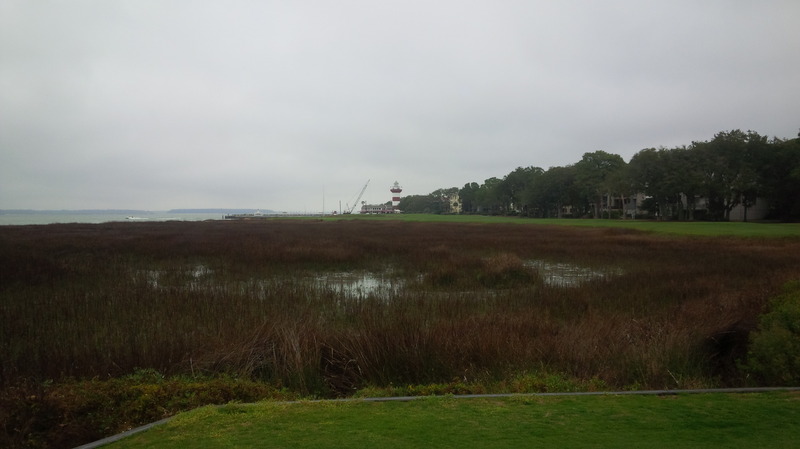 In photographs and on television, Harbour Town appears to be almost unreasonably narrow, with every hole containing at least one or two trees protruding out over the fairway. I smacked my fair share of tee shots into some of those overhanging trees. However, almost all of those shots were bad or misdirected shots by me, not good shots that I should be mad about being penalized for. In my mind, that will make me remember Harbour Town as a challenging, yet eminently fair test of golf, not only for touring professionals, but for amateurs of varying skill levels as well. You come around the corner of the dog leg 16th hole, and there is Calibogue Sound, with all its wind and splendor, to take your breath away for just a second. Most avid golf watchers are familiar with Harbour Town’s “television holes,” numbers 16, 17, and 18. Those are the only holes on the from which you have an unobstructed view of the Ocean. And make no mistake, they are certainly memorable, and so visually stunning that the view almost interferes with the ability to finish a round of golf competitively. The main criticisms of Harbour Town I read and heard quite a bit of before actually playing the course were that 1.) the first 15 holes were kind of average for Hilton Head Island, 2.) the course can be in “average” condition except for the two weeks before and after the Heritage Classic, and 3.) for all his skill in designing great short par 4 holes, Pete Dye is regarded by some as way overrated as a designer of great par 3 holes. The grand view from the 17th tee is not only wonderful visually, it broad horizon of the Sound also makes the green appear even narrower than it really is. After actually playing Harbour Town, I could not disagree any more strongly with all three criticisms. I thought five holes on the front nine (# 4, 5, 7, 8, & 9) were great golf holes that were as individually as memorable as the closing stretch adjacent to Calibogue Sound. They each presented a unique challenge, and would all play differently under varying course conditions (wind speed, direction, course moisture, etc.). I thought all nine final holes were maybe the best single side of golf I’ve ever played. Doglegs left, doglegs right, short holes, long holes, interesting and strategic bunkering, water in play, forced carries, the back nine has it all. And of course, there’s the vista of Calibogue Sound that accompanies the final three holes. It was “breezy” all day, until I reached the 18th tee, where a stiff 30-40 mph wind was blowing straight at me from the iconic Lighthouse. For being at the tail end of an exceptionally cold winter that just won’t end, I found Harbour Town’s conditioning to be stunningly, exceptionally great. Save for the ongoing construction near the clubhouse and the in-progress erection of the tournament grandstands, I thought the course was tournament ready on March 5, some five weeks before the RBC Heritage comes to town. 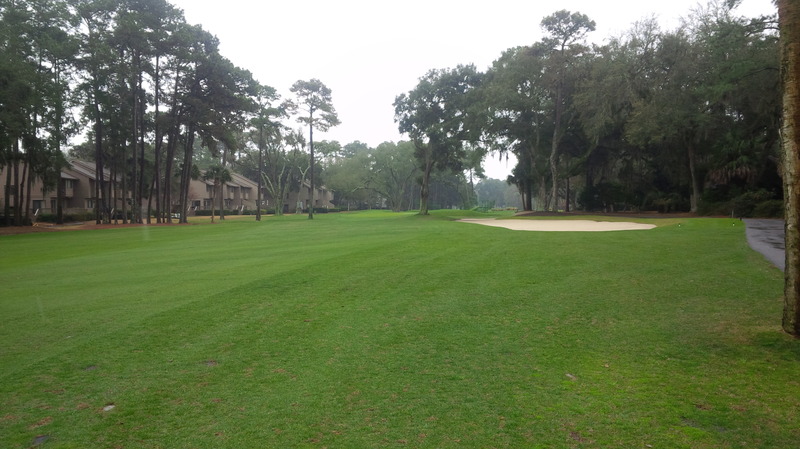 The fairways and rough were lush, the greens fast and firm, and the pine straw was appropriately fluffy. It had rained for two days prior to my round, but there wasn’t a single puddle to be found. A few of my drives plugged or checked up in the fairways, but I didn’t end up wearing any mud or sand exploding out of any of my divots. Not even rain, clouds, cold, and wind could dampen my spirits as I walked off the 18th green. All four par 3 holes at Harbour Town were great and independently memorable golf holes, in my mind. Number 4 is a hole that I recognize from watching the Heritage over the years, where challenging the water short and left rewards the brave, but the bailout area right of the green comforts the meek. Number 7 is clever hole containing virtually an island green surrounded by concentric moats of trees, bunkers, and water. 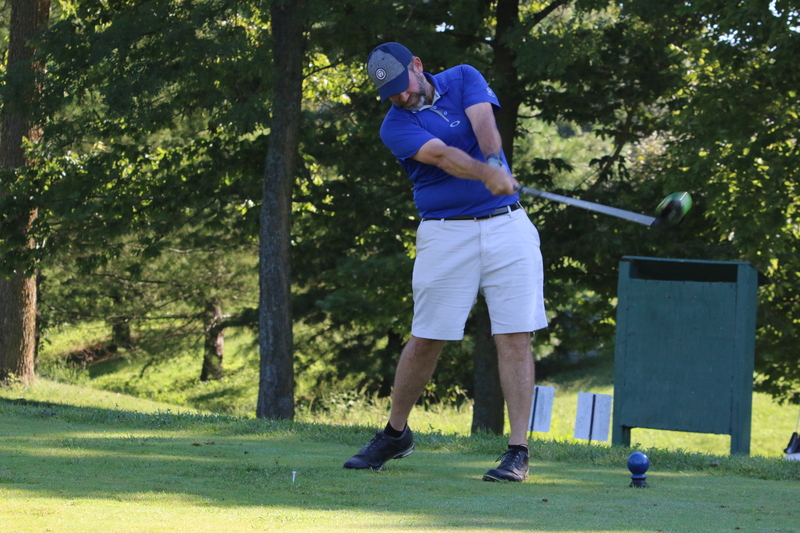 Number 14 requires the most demanding tee shot, as water hugs the green short and right, without much of a bailout area to speak of and a pot bunker deters overclubbing the tee shot. And Number 17, while guarded by bunker and water down the left side from tee to green, overcoming the visuals in the background and the wind coming off the Sound may be the true defenders of this medium length par 3. 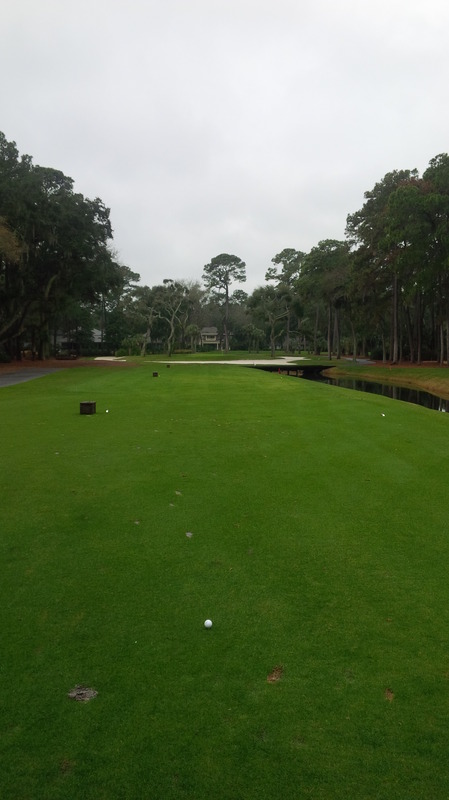 If nothing else goes right this year, I will be satisfied having crossed Harbour Town Golf Links off the To-Do List. 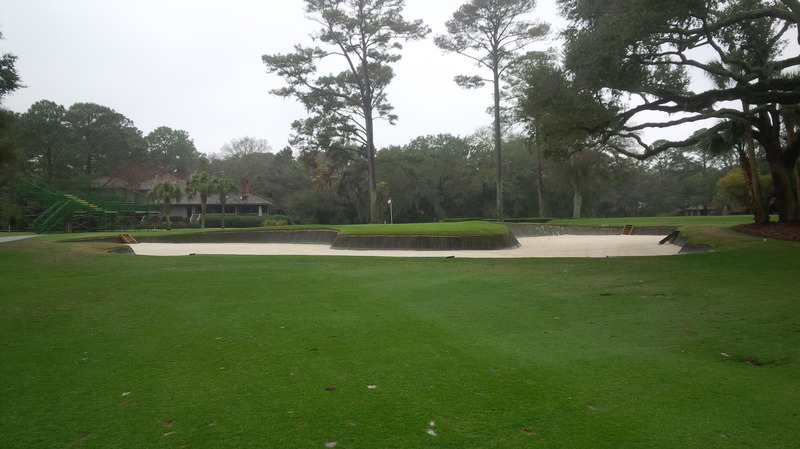 Playing Harbour Town Golf Links on an otherwise miserably cold, wet day produced an unforgettable golf experience. The golf course far exceeded all my expectations and I won’t hesitate to play it again on my next trip to the South Carolina Lowcountry. 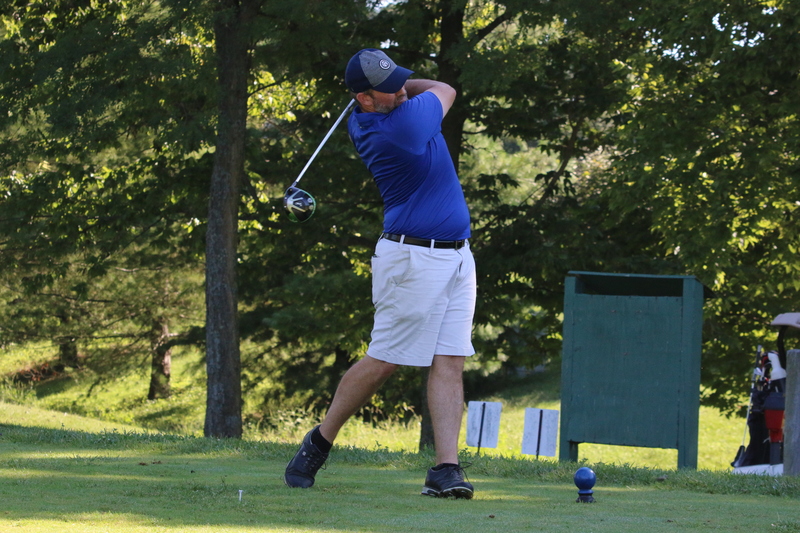 The cost of playing the course during the spring or summer months requires real money, but it’s definitely playing at least once, and truly deserves to be on the avid golfer’s bucket list. I was thrilled to card an 89 on the day, having lost only one golf ball for the round. As difficult as the conditions were, I didn’t fee defeated or beaten up by the golf course. 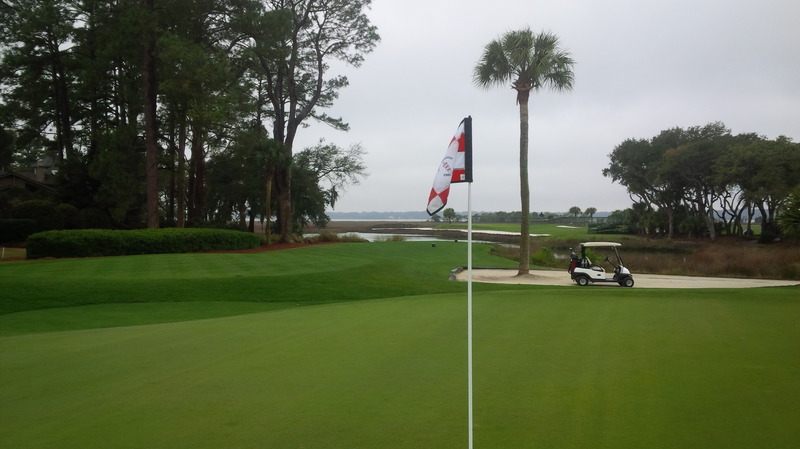 My assessment: Harbour Town is really difficult, really fun golf course to play. The challenges were of the risk/reward variety, which I find lends itself to a sense of fundamental fairness. And if you ever have the chance to have such a majestic golf course all to yourself, like I did, don’t let the opportunity pass you by. I can’t fathom that you’d ever regret it. Must have been a very cool experience having this championship venue to yourself. . .and a personal beverage vendor to boot! 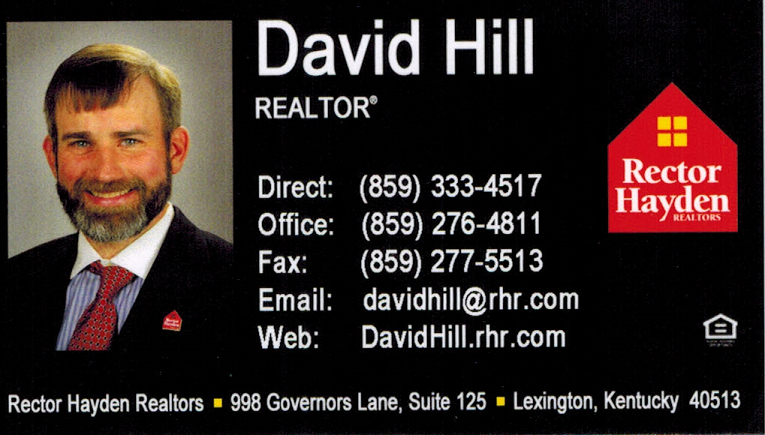 Excellent review, thanks! Thanks, Brian. Definitely a memory I’ll savor. Though, in reality, I’m sure “that fish will get bigger every time” I tell the Harbour Town story. I wouldn’t wish the weather we had on anybody, but it certainly made for some unique experiences.